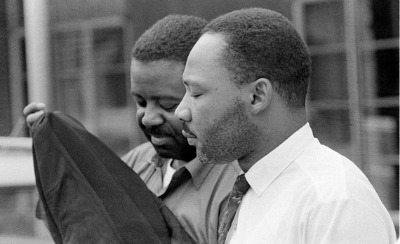 Abernathy and King after being released from the Birmingham jail. Many enjoy today as a holiday from work, which means you have some open time on your schedule. And even if you didn't get a holiday, we all have an opportunity today to take a moment and remember that God is the author of every race, tribe, nation, and people, and that it is his design that all races exist in harmony. This hope - racial harmony - will be our focus in the worship service this coming Sunday at Calvary. The way we will pause and remember as a family today will be around our supper table, by reading a section from Martin Luther King's "Letter from a Birmingham Jail." It is particularly poignant to me, as he is responding to criticism from fellow clergymen due to his activities in the cause of racial equality. Recreation of Luther's cell in the Birmingham Jail, National Civil Rights Museum. We have waited for more than three hundred and forty years for our God-given and constitutional rights. The nations of Asia and Africa are moving with jetlike speed toward the goal of political independence, and we still creep at horse-and-buggy pace toward the gaining of a cup of coffee at a lunch counter. I guess it is easy for those who have never felt the stinging darts of segregation to say "wait." I recommend you read the whole letter, available at The Atlantic.